Get 1 red tickets by sharing! Shadow of the Tomb Raider Season Pass is the season pass of the new delivery of our beloved Lara Croft, Shadow of the Tomb Raider. As in the other deliveries, in order to access all the content provided by this Season pass, you need to have the basic game, which is not included in this product. The content provided by this title includes a multitude of new challenges and adventures for Lara. It will unlock 7 challenging tombs, along with 7 weapons, outfits and unique abilities. It also includes several narrative side quests. 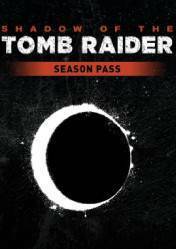 Remember that Shadow of the Tomb Raider will be released on September 14, 2018 and on the same day the Season pass for this game is available, so not only will we be able to access all the new and exclusive content at the moment, but we will also have access to all the DLCs that will be released in the future. There are no comments yet about Shadow of the Tomb Raider Season Pass. You can be the first one! Access now to comment and win this game for free! Access now and get 5 tickets as reward to join to weekly giveaways. Easy and for free! Wait for Sale!? Reacting to Shadow of the Tomb Raider New Adventures SEASON PASS TRAILER!